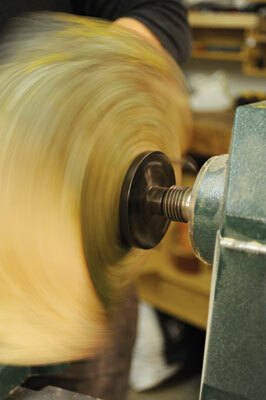 Holding and causing wood to revolve in a safe and controlled manner is fundamental to our woodturning. We all know the consequences of getting this process wrong. Brian McEvoy, from One Good Turn, sent these items to me last year and I was immediately intrigued. Facing me was a selection of 2MT drives - 50, 63 and 90mm (2, 2 Â½ and 3 1/2in) diameters respectively. They are black in colour and the front end is a flat round section with six holes in it. Two are threaded which accept machine screws - sharpened to a point - which can be wound forward and back to vary their length of projection past the front of the face. There is a central hole, which has a point in it, which in turn can be moved in an out to alter its projection distance and this can be locked in place via a grub screw at the back of the faceplate. There are also three other holes in the round plate and these can be used to put screws through so as to make this truly into a faceplate. Of course, this option would facilitate removing the machine screws and winding back the central pin, although this is a good locator point when you are finding the centre of the work. Looking at the drive/faceplate it immediately offers the turner drive options and opportunities that one will not get with a dedicated faceplate or standard drive. My immediate thoughts were that the adjustable machine screws would make this ideal for use on logs and large spindles and bowl grain orientation - natural edge work - and since I also mount most of my bowls between centres to start with while I turn the back of them, then this would work for that as well even if they are flat on the top face. At around $40-$50 (Â£25.24-Â£31.55) depending on their size, the price isnâ€™t unreasonable. When using the items I found them to be easy to operate and have used them now for just under a year in a wide variety of situations. I tried them on end grain spindles and bowl work of all different types and found that when the adjustable pins were located into the work, that a solid drive was created which presented no problems. I did wonder about whether the pins would work loose in use, but this did not happen. To provide a little more safety one could put nuts on the back end and pinch these up to provide a solid lock on the machine screws. The faceplate option worked well, but unless I was working on small items only, I would always use the tailstock for support with this option. I think these are well work looking at and certainly give flexibility of use to the turner. I like them a lot. I could immediately see the versatility of these drives. 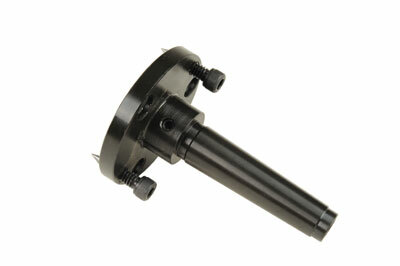 The machining was OK and I too found that they worked well in use without any problems. The price is not bad at all. In short, simple and effective.